New Delhi: Finance Minister Arun Jaitley unveils the budget on 1 February. 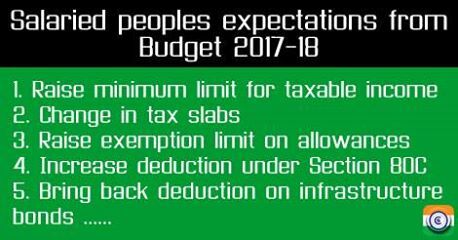 The salaried class has a lot of expectations from the Budget. Increase in the personal income tax exemption limit and a higher deduction limit on home loan interest are among the common ones, say analysts. Considering the increase in cost of living, the current basic exemption limit of 2.5 lakh should be raised to Rs. 3 lakh. If the minimum limit is increased, it will not only benefit taxpayers at the bottom but also salaried class youth who are starting out as employees. A Change in of tax slabs will be a big balm for the salaried class. Currently, 10 per cent tax is charged on annual income of Rs 2.5 lakh to Rs 5 lakh, 20 per cent on Rs 5 lakh to Rs 10 lakh and 30 per cent on income above Rs 10 lakh. The first two slabs can be widened or taxed at a lower rate. Salaried employees enjoy exemption from tax on several allowances/benefits that the employer provides such as children's education, conveyance, medical reimbursement, house rent and leave travel. The allowance limits were fixed a long time ago and need to be revised in view of inflation. Currently, deduction under Section 80C of the Income-tax Act is allowed from Rs 150,000 to Rs 300,000. If Jaitley increases the limit, he can boost household savings which can ultimately get invested and power growth. The government may reintroduce deduction of Rs 20,000 or actual amount invested, whichever is lower, for investments made in infrastructure bonds. This will also boost spending, spur growth and create more jobs. Jaitley can offer more incentives for taxpayers to invest in the National Pension System (NPS). He can increase the deduction under Section 80CCD (1B) to Rs 100,000 from the existing Rs 50,000. He can also being NPS on par with the Employees Provident Fund or Public Provident Fund with respect to exemption of 100 per cent of the accumulated balance on withdrawal, subject to certain conditions. Prime Minister Narendra Modi has already offered interest subvention of 3 per cent and 4 per cent for loans of up to Rs 12 lakh and Rs 9 lakh, respectively, under the Pradhan Mantri Awas Yojana. However, these subventions are targeted at buyers in Tier 3 cities. Budget 2017 has scope of offering interest subvention on larger amounts of loan which will benefit buyers in big cities and other urban areas. Currently, the deduction available on interest on home loan is up to Rs 2,00,000. The deduction can be claimed on the principal repayment for up to Rs 1.50 lakh. There is a large scope in both cases to raise the deduction limits. Deduction for interest on home loan is currently available only after the buyer gets the possession of the property. This means the benefit begins several years after the buyer gets the home loan and begins paying the EMIs. This deduction can be given right from the payment of the first EMI. The existing exemption limit of Rs 300,000 for senior citizens (60 years to less than 80 years) and Rs 500,000 for super senior citizens (80 years and above) could be enhanced to Rs 400,000 and Rs 600,000 respectively.